A dart is used to shape a flat piece of fabric to fit bust, waist, hip or elbow curves. There are two types of darts. A single-pointed dart is wide at one end and pointed at the other. A shaped dart has points at both ends. It is usually used at the waistline, with the points extending to the bust and hips. Besides providing a closer fit, darts are also used to create special designer touches and unique styles. Perfect darts are straight and smooth, not puckered at the ends. The darts on the right and left sides of the garment should have the same placement and length. 1. Mark dart suing appropriate marking method for fabric. Mark point of dart with horizontal line. 2. Fold dart on center line, matching stitching lines and markings at the wide end, the point and in between. 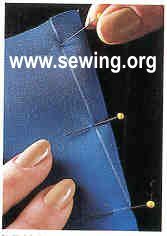 Pin in place, with heads of pins toward folded edge for easy removal as you stitch. 3. Stitch from wide end to point of dart. Backstitch at beginning of stitching line, then continue stitching toward point, removing pins as you come to them. Shaped darts are stitched in two steps, beginning at the waistline and stitching toward each point. Overlap stitching at waist about 1" (2.5 cm). Clip dart fold at waistline and midway along points, to within 1/8" to ¼" (3 to 6 mm) of stitching to relieve strain and allow dart to curve smoothly. Wide darts and darts in bulky fabrics should be slashed open on the fold line and trimmed to 5/8" (1.5 cm) or less. Slash to within ½" (1.3 cm) of point. Press dart open and press point flat. Press darts over the curve of a tailor's ham to maintain the built-in curve. Vertical darts are usually pressed toward the center front or center back. Horizontal darts are usually pressed downward. 4. Taper to point of dart. When ½" (1.3 cm) remains, shorten stitch length to 12 to 16 stitches per inch (2.5 cm). Take last two to three stitches directly on fold. Do not backstitch at the point, because this may cause puckering. Continue stitching off edge of fabric. 5. Raise presser foot and pull dart toward front. About 1" (2.5 cm) back from point of dart, lower presser foot and secure thread by stitching several times in fold of the dart with stitch length set at 0. Clip threads close to knot. 6. Press folded edge of dart flat, being careful not to crease fabric beyond the point. Then place dart over curve of tailor's ham and press in proper direction .for a neat, flat finish, press darts before they are stitched into a seam.